Although sudden dental injuries such as chipped teeth, gum bleeding etc. can occur without warning; taking adequate precautions can reduce the pain to a great extent. However, home remedies and trying to fix things on your own can do more harm than good. Hence, the best course of action is to seek expert dental care from an emergency dentist- whose office remains open 24/7. It is always wise to not let dental problems escalate beyond repair. Hence, a visit to your nearest emergency dental clinic at any time of the day is the most feasible solution. Therefore, keeping some contact details of such clinics handy might save the day. Cambridge, Massachusetts is home to two of the most prestigious universities in the United States, namely Harvard University and Massachusetts University of Technology. The city boasts a population of around 105,162. In a bustling city populated by students, educators, and researchers from home and abroad; emergency dentists are always in great demand. Therefore, those who live in Cambridge might need a dentist in case of dental mishaps. It is best to write down the names of some nearby dentists, as you never know when they might be needed. That is why we have made a list of a few places where you could go to if you have an emergency. The goal of Coply Dental Associates is to provide their patients with the highest standard of dental care while maintaining a relaxed and homely environment. They provide specialized care in Root Canal Therapy, Cosmetic Dentistry and Oral Surgery. Located at 551 Boylston St. the dental clinic can be reached at their special emergency hotline 617-536-4020. Dentistry located at 20 Holland St, Great Hill boasts a team of caring and qualified dental staff. Their goal is to provide quality dental care in a comfortable and convenient setting. Sedation Dentistry, Whitening, Veneers, Extraction, Implants etc. are but some of the services they provide for their patients. 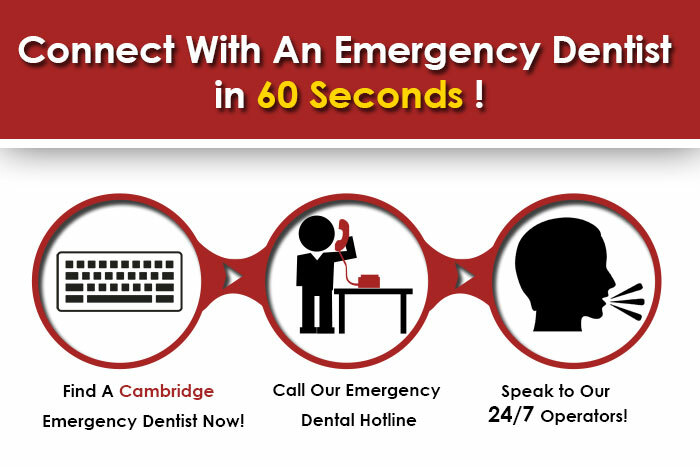 In case of dental emergencies, give them a call at 617-764-3440. The philosophy of this dentistry is to spend time with each person that walks through their doors requiring the services of the dentist. Being experienced in dealing with a host of dental problems, the treatments they provide include cosmetic treatments, restorative dentistry, sedation dentistry etc. The location of the dental practice is at 2400 Massachusetts Avenue. You can note down their number 617-547-9100. The dentistry has talented doctors such as Dr. Vihangi Thakore, Dr. Samuel Gegamian, Dr. Martin Urban, and Dr. John Haze, all of whom provide services, such as Preventive Services, Oral Surgery including Implants, Periodontics, Teeth Whitening, Orthodontics, and Emergency Dental Care, etc. Their clinic is located at Fresh Pond Mall, 180 Alewife Brook Parkway, and you can contact their toll free number at 888-717-1692 for more information or to boon an appointment.